Whey Protein Concentrate is produced as a byproduct of cheese which undergoes a cold-water microfiltration process in order to remove unwanted fat and lactose. The resulting powder is a great-tasting, easy-mixing, and economic protein option for post-workout nutrition or as needed in your daily diet! 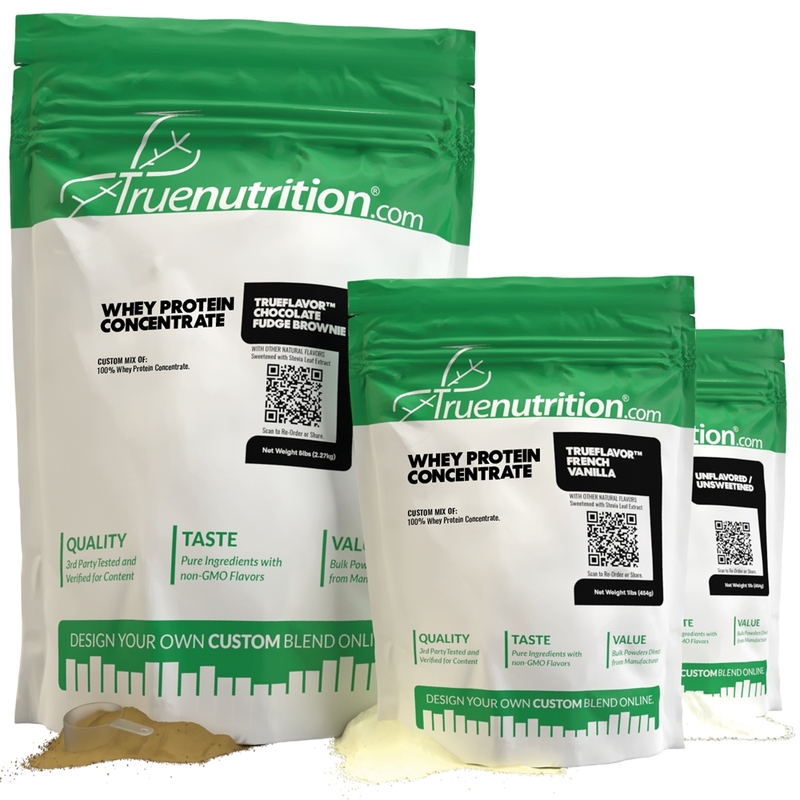 True Nutrition's Whey Protein Concentrate is sourced from the USA, and is instantized using sunflower lecithin. Providing 24g of protein to help support muscle-building! Uses: Supports Muscle Building: Provides 24g of protein to help support muscle building! Taste: Mild milky taste that goes great with most flavors! Whey Protein Concentrate (Milk), Sunflower Lecithin (Less than 1%). CONTAINS: MILK. Although this product may not contain one or all of the following, this product is manufactured in a facility that handles milk, soy, egg, peanut, nut, tree, fish, crustaceans/shellfish, and wheat products. Purchased with medium Vanilla Artificial flavoring. The taste is OK to start but is very rough going down - almost like a burning sensation at the back of my throat. Not sure if this is due to the flavor or impurities / bad batch of Whey. Let's be honest - vanilla flavoring is very basic, very hard to mess up. Hugely disappointed with my purchase - sadly two pounds of protein into the trash. Love this whey especially the price. The flavors are amazing! I am a basic vanilla whey protein drinker and love it. I always get it boosted with probiotic. Would recommend to everyone! Love this protien and it's a great price. So far I have gotten, strawberry (good), fruit punch(not my favorite) and chocolate peanut butter cup(amazing). It mixes really well with water and gets a little clumpy with milk. I do half/half with milk and water. Mixes really well in a blender with just water, especially compared to the High Grade (eek). So far I have gotten the plain chocolate and strawberries & cream flavors w stevia & PEC as additives, and they are both good flavors in my opinion. I would opt to get the rbgh-free WPC but the Super Grade is cheaper, especially with the additional shipping & handling cost. This protein is a large step up from the "high grade" version. Has good texture and has good nutritional values. My wife and I got it birthday cake flavored and it could definitely benefit from heavy rather than normal. Normal flavoring is due but the milky taste that comes with whey proteins almost masks it. It mixes great and doesn't leave any chunks or residue unlike the high grade version. Defiantly recommend this or the Gemma pea protein! Pure protein, good stuff. Mixes well with milk, and the flavor is not strong at all. Mostly taste of milk. If your looking for more flavor, and chunkiness, i'd opt for the Soy.